Politico has a big piece tied to a Showtime documentary on the living CIA Directors. As should be expected of a collection of paid liars, there are a lot of myths and score settling, most notably with expanded George Tenet claims about the strength of the warnings he gave about 9/11. But I’m most interested in this insight, which seems very apt given recent intelligence failures and successes. This is, of course, the counterpoint to Hayden’s claim that “we kill people based on metadata.” But it says much more: it describes how we’re viewing the world in terms of targets to kill rather than people to influence or views to understand. Hayden argues that prevents us from seeing the broader view, which may include both theaters where we’re not actively killing people but also wider trends. Which is why I’m so interested in the big festival the US and UK — David Cameron, especially (of course, he’s in the middle of an effort to get Parliament to rubber stamp the existing British dragnet) — are engaging in with the presumed drone-killing of Mohammed Emwazi, nicknamed Jihadi John by the press. “If this strike was successful, and we still await confirmation of that, it will be a strike at the heart of ISIL,” Cameron said, using an acronym for the Islamic State. “This was an act of self defense. It was the right thing to do,” he said. But it is not clear that Emwazi had a meaningful role in Islamic State’s leadership structure. Analysts said the impact of his possible death could be limited. “Implications? None beyond the symbolism,” said a Twitter message from Shiraz Maher, an expert on extremism at King’s College London. It also might be a way to permanently silence questions about the role that British targeting of Emwazi had in further radicalizing him. And all this comes just a few weeks after ISIS affiliates in Egypt claim to have brought down a Russian plane — depending on how you count, the largest terrorist attack since 9/11. Clearly, the combined British and US dragnet did not manage to prevent the attack, but there are even indications GCHQ, at least, wasn’t the agency that first picked up chatter about it. Information from the intelligence agency of another country, rather than Britain’s own, led the Government to conclude that a bomb probably brought down the Russian airliner that crashed in the Sinai. It was reports from an undisclosed “third party” agency, rather than Britain’s own GCHQ, that revealed the so-called “chatter” among extremists after the disaster that killed all 224 passengers and crew – and ended with the suspension of all British flights to Sharm el-Sheikh, according to authoritative sources. British officials are said to have asked whether the same information had also been passed to Egypt, and were told that it had. Sources declined to say which friendly country passed the information. The US and Israel – whose own borders have been threatened by Isis in Sinai – as well as Arab nations in the region all have an interest in monitoring activity in the area. So while it’s all good that the Americans and Brits took out an ISIS executioner in Syria — thereby avenging the deaths of their country men — it’s not like this great dragnet is doing what it always promises to do: prevent attacks, or even understand them quickly. Perhaps that’s because, while we approach ever closer to “collect[ing] it all,” we’re targeting rather than analyzing the data? In a bid to extend a dragnet that has proven useless in the function the Intelligence Community claims it serves, Mitch McConnell is claiming there are secret reasons we need to keep the dragnet. It’s possible this is just a tactic, to gain leverage to make USA F-ReDux even worse. 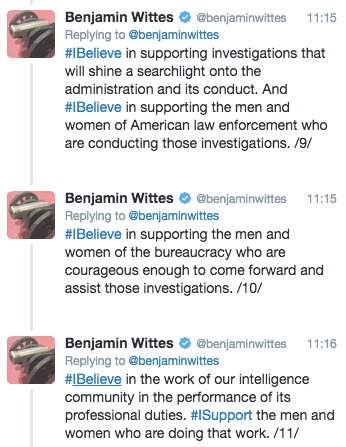 It’s possible that McConnell just wants to retain the dragnet to identify people to coerce into becoming informants, the use the FBI has claimed for the dragnet that never got included in its more public assessments of value. It’s possible McConnell wants to retain a dragnet — and finally expand it to include most Internet metadata — because he can (and all of our Five Eyes allies have done so in the wake of Snowden’s leaks). But I want to submit another possibility, based on the Stellar Wind IG Report. In its assessment of the Stellar Wind dragnet — the same section that notes that 1.2% of all tips made a “significant” contribution to finding terrorists (and that measure included deporting suspected terrorists and identifying potential informants, not just identifying actual terrorists) and Internet dragnet tips had made no contribution — the report explained Michael Hayden’s justification. Hayden also observed that the enemy may not have been as embedded in the United States as much as feared but said that he believes Stellar Wind helped determine this. Now, remember, to justify operating this program in defiance of the law (and to justify getting FISC to rubber stamp it in 2004 in defiance of common sense), John Brennan and his colleagues would routinely write a “scary memo” to establish that the threat of a terrorist attack on the US was so big that the government needed the program. Probably, they used Khalid Sheikh Mohammed’s claim that he had gotten a Briton to recruit non-existent black Muslims in Montana to start forest fires for the 3 months of 2003 that CIA believed that ruse. We know in 2004, the CIA drummed up fear of an election year plot — seeded by a fabricator and sustained through CIA’s use of torture — to sustain the initial Internet dragnet order. The point is, for the entire life of the dragnet, the government justified it by talking about scary terrorists embedded in the US. 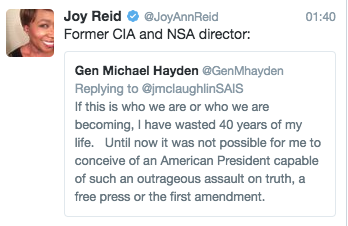 And then, when challenged in 2009 to explain the value of the dragnet, Hayden explained that it was useful because it proved those claims of scary terrorists embedded in the US turned out to be overblown. The best Hayden can offer — after years of overseeing a dragnet — is that it proved the IC’s overblown claims in the first place were overblown. Behind all this dragnettery, then, lies a great deal of masturbatory fear-mongering. One of the most fascinating aspects of the IG Reports Charlie Savage just liberated is how they redacted the NSA IG Report, a draft of which Edward Snowden already got released. Starting at PDF 146, the entire section describing what Michael Hayden did in the days immediately after 9/11 is redacted. Here’s what is included in the Snowden version. (TS//SV/NF) On 14 September 2001, three days after terrorist attacks in the United States, General Hayden approved the targeting of terrorist-associated foreign telephone numbers on communication links between the United States and foreign countries where terrorists were known to be operating. Only specified, pre-approved numbers were allowed to be tasked for collection against U.S.-originating links. He authorized this collection at Special Collection Service and Foreign Satellite sites with access to links between the United States and countries of interest, including Afghanistan. According to the Deputy General Counsel, General Hayden determined by 26 September that any Afghan telephone number in contact with a U.S. telephone number on or after 26 September was presumed to be of foreign intelligence value and could be disseminated to the FBI. (U//FOUO) On 2 October 2001, General Hayden briefed the House Permanent Select Committee on Intelligence (HPSCI) on this decision and later informed members of the Senate Select Committee on Intelligence (SSCI) by telephone. He had also informed DCI George Tenet. (TS) At the same time NSA was assessing collection gaps and increasing efforts against terrorist targets immediately after the 11 September attacks, it was responding to Department of Defense (DoD), Director of Central Intelligence Community Management Staff questions about its ability to counter the new threat. We can tell the discussion in the released version is different, even though it is entirely redacted. That’s because the discussion is longer, appears to include two footnotes, and has some indentations that don’t appear in the Snowden version. The final report redacts a discussion (PDF 148-149) titled, “Vice President Asked What Other Authorities NSA Needed.” Some related discussion appears in the Snowden version, but clearly not the entire discussion. Mr. Tenet relayed that the Vice President wanted to know if NSA could be doing more. General Hayden replied that nothing else could be done within existing NSA authorities. In a follow-up telephone conversation, Mr. Tenet asked General Hayden what could be done if he had additional authorities. General Hayden said that these discussions were not documented. Though it’s possible — perhaps even probable — that what the NSA draft depicts as NSA identifying its own needs is actually Hayden getting people to identify the needs Cheney had already identified for him. In any case, the final IG report complains that none of this was documented, which suggests there was far more of interest that actually went on in these discussions. Perhaps most interesting, the NSA redacts almost all of whatever became of this discussion. Among other things, NSA considered how to tweak transit collection-the collection of communications transiting through but not originating or terminating in the United States. NSA personnel also resurfaced a concept proposed in 1999 to address the Millennium Threat. NSA proposed that it would perform contact chaining on metadata it had collected. Analysts would chain through masked U.S. telephone numbers to discover foreign connections to those numbers, without specifying, even for analysts, the U.S. number involved. In December 1999, the Department of Justice (DoJ), Office of intelligence Policy Review (OIPR) told NSA that the proposal fell within one of the FISA definitions of electronic surveillance and, therefore, was not permissible when applied to metadata associated with presumed U.S. persons (i.e., U.S. telephone numbers not approved for targeting by the FISC). Though PDF 150 appears to have a footnote that would modify that discussion (but that doesn’t appear in the Snowden version). According to NSA OGC, DoJ has since agreed with NSA that simply processing communications metadata in this manner does not constitute electronic surveillance under the FISA. This footnote may refer to the SPCMA decision in 2007 to 2008. Except that’s not what Binney et al proposed back in 1999. On the contrary: SPCMA permits NSA to chain through unmasked US person metadata, whereas Binney had proposed permitting only chaining through masked US person identifiers. Which suggests the George Ellard may have been misrepresenting what was possible in this sensitive IG Report designed for Congress. Under its authorities, NSA had no other options for the timely collection of communications of suspected terrorists when one end of those communications was in the United States and the communications could only be collected from a wire or cable in the United States. No wonder they redacted the Binney discussion. On September 14, 2001 — 3 days before signing an expansive Memorandum of Notification that would authorize a suite of covert operations against al Qaeda, and 4 days before signing an AUMF that would give those operations the appearance of Congressional sanction — President Bush declared a National Emergency in response to the 9/11 attack. The following day, according to a 2002 motion to the FISC to be able to share raw FISA-derived information with CIA and NSA (this was liberated by Charlie Savage), FISC suspended its rules on sharing intelligence derived under FBI-obtained FISA warrants with criminal investigations (see page 26 of this paper for background). A full month later, on October 25, 2001, Congress passed the PATRIOT Act. For over 13 years, analysis of the PATRIOT Act has explained that it eliminated “the wall” between intelligence and criminal investigations by replacing language requiring foreign intelligence be “the purpose” of FISA wiretaps with language requiring only that that be “a significant purpose” of the wiretap. But the FISC suspension had already removed the biggest legal barrier to eliminating that wall. In other words, the story we’ve been telling about “the wall” for over 13 years is partly wrong. The PATRIOT Act didn’t eliminate “the wall.” “The wall” had already been suspended, by dint of Executive Proclamation and a secret application with the FISC, over a month before the PATRIOT Act was initially introduced as a bill. FISC suspended it, without congressional sanction, based on the President’s invocation of a National Emergency. That’s not the only case where the Executive invoked that National Emergency in self-authorizing or getting FISC to authorize expansive new surveillance authorities (or has hidden the authorities under which it makes such claims). Perhaps most illustratively, on May 6, 2004, Jack Goldsmith pointed to the National Emergency when he reauthorized most aspects of Stellar Wind. On September 14, 2001. the President declared a national emergency “by reason of the terrorist attacks at the World Trade Center, New York, New York, and the Pentagon, and the continuing and immediate threat of further attacks on the United States.” Proclamation No. 7463, 66 Fed. Reg. 43, !99 (Sept. 14, 2001). The United States also launched a massive military response, both at home and abroad. In the United States, combat air patrols were immediately established over major metropolitan areas and were maintained 24 hours a day until April 2002, The United States also immediately began plans for a military response directed at al Qaeda’s base of operations in Afghanistan. Only after invoking both the Proclamation and the immediate military response that resulted did Goldsmith note that Congress supported such a move (note, he cited Congress’ September 14 passage of the AUMF, not Bush signing it into law on September 18, thought that may be in part because Michael Hayden authorized the first expansions of surveillance September 14; also remember there are several John Yoo memos that remain hidden) and then point to an article on the friendly-fire death of Pat Tillman as proof that combat operations continued. On September 14, 2001, both houses of Congress passed a joint resolution authorizing the President “to use all necessary and appropriate force against those nations, organizations, or persons he determines planned, authorized, committed, or aided the terrorist attacks” of September I I. Congressional Authorization § 2(a). Congress also expressly acknowledged that the attacks rendered it “necessary and appropriate” for the United States to exercise its right “to protect United States citizens both at home and abroad,” and acknowledged in particular that the “the President has authority under the Constitution to take action to deter and prevent acts of international terrorism against the United States.” id. pmbl. Acting under his constitutional authority as Commander in Chief, and with the support of Congress, the President dispatched forces to Afghanistan and, with the cooperation of the Northern Alliance, toppled the Taliban regime from power Military operations to seek out resurgent elements of the Taliban regime and al Qaeda fighters continue in Afghanistan to this day. See, e.g., Mike Wise and Josh White, Ex-NFL Player Tillman Killed in Combat, Wash. Post, Apr. 24, 2004, at AI (noting that “there are still more than 10,000 U.S. troops in the country and fighting continues against remains of the Taliban and al Qaeda”). That is, even in an OLC memo relying on the AUMF to provide legal sanction for President Bush’s systematic flouting of FISA for 2.5 years, Goldsmith relied primarily on the National Emergency Proclamation, and only secondarily on Congress’ sanction of such invocation with the AUMF. The White Paper released in 2006 largely regurgitating Goldsmith’s opinion for more palatable consumption mentions the AUMF first in its summary, but then repeats Goldsmith’s emphasis on the Proclamation in the background section (see pages 2 and 4). Paragraphs that may discuss such authorizations get redacted in the 2006 application to move content collection under FISC (see page 6). The entire background section (starting at page 5) of the initial Internet dragnet application is also redacted. While we can’t be sure, given parallel claims made in the same 2004 to 2006 period, it seems likely those memoranda also repeated this formula. Such a formula was definitely dropped. The 2006 memorandum in support of using Section 215 to create a phone dragnet included no mention of authorities. The 2007 memorandum to compel Yahoo to fulfill Protect American Act orders cites PAA, not Emergency Declarations. But the formula was retained in all discussions of the Administration’s illegal wiretap program in secret declarations submitted in court in 2006, 2007, and 2009, being repeated again in an unclassified 2013 declaration. While these declarations likely all derive, at least in part, from Goldsmith’s memo, it’s worth noting that the government has consistently suggested it could conduct significant surveillance programs without Congressional sanction by pointing to the that National Emergency Proclamation. This is the precedent I meant to invoke when I expressed concern about President Obama’s expansive Executive Order of the other day, declaring a National Emergency because of cybersecurity. Update: In his October 23, 2001 OLC memo authorizing the President to suspend the Fourth Amendment (and with it the First), John Yoo said this but did not invoke the September 14, 2001 proclamation per se. As applied to the present circumstances, the [War Powers Resolution] signifies Congress’ recognition that the President’s constitutional authority alone enables him to take military measures to combat the organizations or groups responsible for the September 11 incidents, together with any governments that may have harbored or supported them, if such actions are, in his judgment, a necessary and appropriate response to the national emergency created by those incidents. Update: Thanks to Allen and Joanne Leon for the suspend/suspect correction. “Go with our Christian God,” I guess Bush meant. And WaPo notes how tedious it was to get approval to kill a guy whose attacks on the US were years earlier, under Reagan. Former U.S. officials, all of whom spoke on the condition of anonymity to discuss the operation, asserted that Mughniyah, although based in Syria, was directly connected to the arming and training of Shiite militias in Iraq that were targeting U.S. forces. There was little debate inside the Bush administration over the use of a car bomb instead of other means. “Remember, they were carrying out suicide bombings and IED attacks,” said one official, referring to Hezbollah operations in Iraq. The authority to kill Mughniyah required a presidential finding by President George W. Bush. The attorney general, the director of national intelligence, the national security adviser and the Office of Legal Counsel at the Justice Department all signed off on the operation, one former intelligence official said. The former official said getting the authority to kill Mughniyah was a “rigorous and tedious” process. “What we had to show was he was a continuing threat to Americans,” the official said, noting that Mughniyah had a long history of targeting Americans dating back to his role in planning the 1983 bombing of the U.S. Embassy in Beirut. “The decision was we had to have absolute confirmation that it was self-defense,” the official said. This is, presumably, meant to be a big success story for CIA. My hope, however, is that it adds some nuance to debates about our use of drones. If the US kills more collateral casualties using drones than using a classic terrorist technique — in both cases making really attenuated claims about current threats — which is the greatest terror technique? Update: Kevin Jon Heller argues the US violated the Terrorist Bombing Convention.